Arthur of the Britons is a British historical drama produced by Harlech Television (HTV) (now ITV Wales and West) from 1972 to 1973. The show also saw syndication in the United States on PBS stations in the mid-70s. 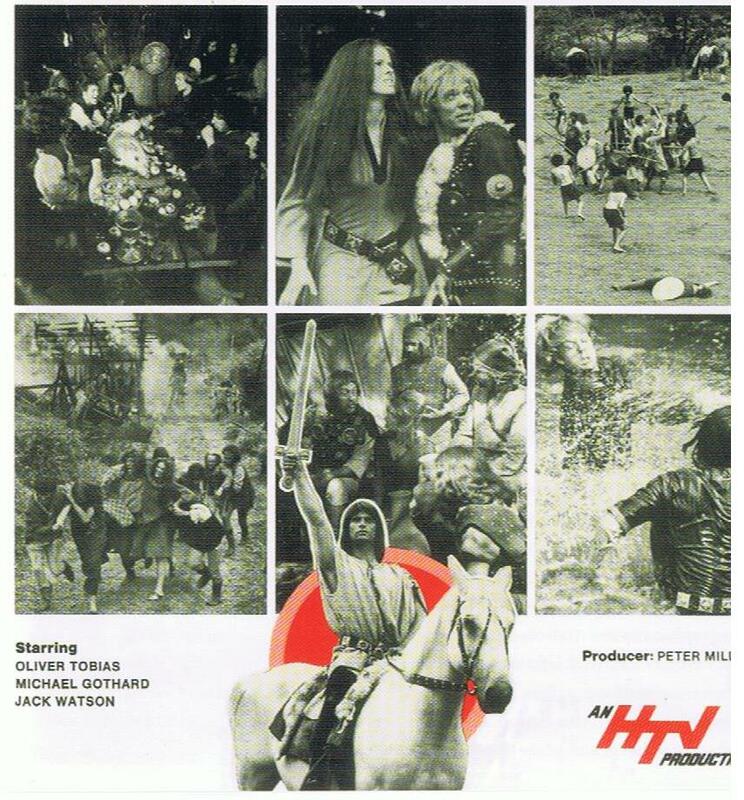 The 24-episode series is noted for putting the Arthurian legend in context of the times in which the legend first arises — the Early Dark Ages as opposed to the High Middle Ages of the movie musical Camelot (1967). The 1975 film compilation of several key episodes, King Arthur: The Young Warlord, was previously reviewed on Aeolus 13 Umbra (see link for more information, including the full-length film). 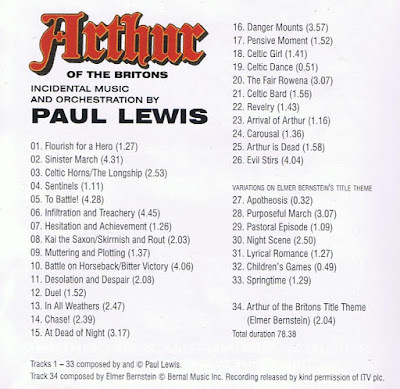 Arthur of the Britons: Original Soundtrack Recording, was released in 2013 by ITV Global Media. The full album is provided above from the Aeolus 13 Umbra YouTube channel and the track list is below at the end of this article. Soundtracks to short-run TV series — particularly those nearly five decades old — are often overlooked, but this one deserves a closer listen. Elmer Bernstein, a master of the genre who composed the title theme for Arthur of the Britons, is widely known for his memorable work on such films as The Man with the Golden Arm (1955), The Ten Commandments (1956), The Magnificent Seven (1960), True Grit (1969), and The Shootist (1976), among many others. Nevertheless, Bernstein’s contribution to the series is just the title track. 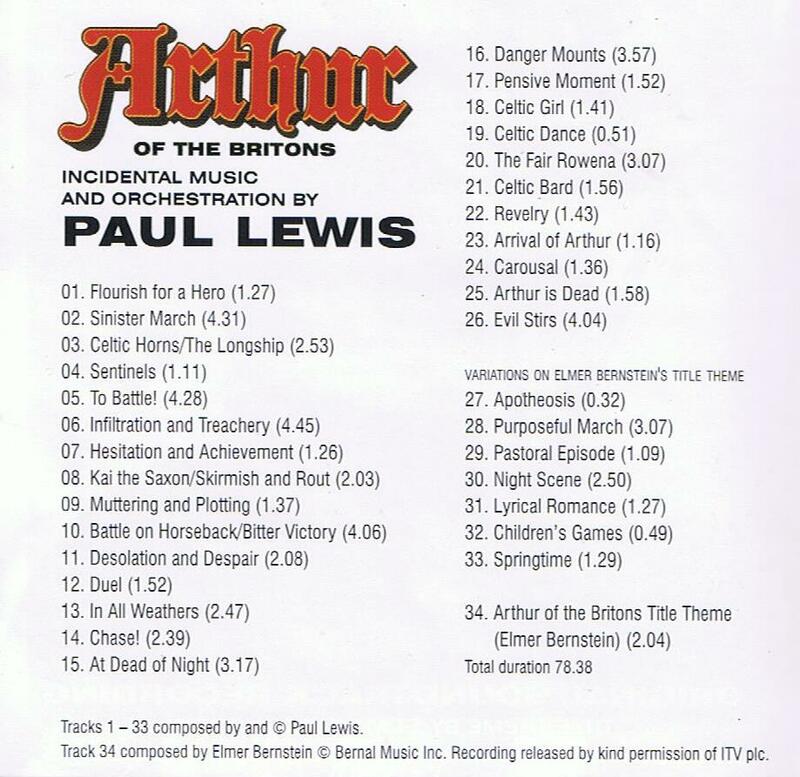 The bulk of the music produced for the series was composed by Paul Lewis, who worked on numerous British TV shows including Monty Python's Flying Circus and The Benny Hill Show, as well as the film Dr. Phibes Rises Again (1972). Lewis was tasked with three challenges. First, he needed to establish a library of musical cues and short pieces that could be used as background throughout the series: battles, chases, early morning sunrises, stormy nights, happy village life, sacking villages, etc. Secondly, whatever he composed had to be synchronous, or at least not widely varied from the general tone established in Bernstein’s title theme. Finally, he had only twenty-five days to complete the project. Bernstein’s theme for Arthur of the Britons is a dramatic piece that evokes action and movement, and in several respects it reminds one of Richard Roger’s theme for Victory at Sea (see links). Both pieces have soaring horns and swelling string arrangements that evoke the military context of each series (the movement of the ocean for Victory at Sea, and the rush of galloping horses for Bernstein’s Arthur of the Britons). Additionally, like Arthur of the Britons, while famed Broadway composer Rogers was tapped for the theme for Victory at Sea, it was Robert Russell Bennett who was responsible for all the incidental music, much like Bernstein was hired for the title theme to Arthur of the Britons while Lewis composed the incidental work. In each series, the theme is an immediately recognizable and irreplaceable facet of the show. Even if the production is sometimes less than epic (the armies are quite small and few horses are seen on screen at any one time), Bernstein’s theme raises it to another level. For tracks 27-33 (beginning at time stamp 1:01:58 in the video above), Lewis composed several variations of Bernstein’s theme, adapting it to different moods, from military to pastoral, while retaining its familiar leitmotif. This builds on Bernstein’s theme and allows the series to utilize it as an emotional touchstone. In a sense, this turns the theme almost into a character in and unto itself. It makes an impression almost as physical as any of the stars, and when it appears it reminds the audience of the epic sweep of the series. In this sense, it demonstrates the importance of a strong theme and the critical error made by producers who underestimate its value, though not in this case. Even on the modest budget available for the series (GBP500,000 in 1972, equal to approximately GBP6,480,746.79, or US$8,343,223, in 2019 for all 24 episodes), HTV recognized they could spend a bit on hiring Bernstein for just the theme, and then hire a talented, but more affordable, composer like Lewis to do the journeyman’s work on the incidental music. It is much the same tactic as used in Victory at Sea. In the liner notes to the album, Paul Lewis provides us with insight to both the soundtrack and the composing process. He had mixed feelings over Bernstein’s title theme, in his own words, preferring “to compose my own title theme,” and noted that it was reminiscent of Bernstein’s work for American Westerns rather than a piece suited for “Dark Age Britain.” Nevertheless, Lewis acknowledged the theme as “rousing and instantly memorable,” though he made some changes, such as replacing the electric bass suggested by Bernstein with three trombones and a kettledrum, making the piece sound more contextual within the historical setting. Altogether, Lewis turns in a complement to Bernstein’s theme that helps draw the various dramatic elements of the series together into a more uniform production. 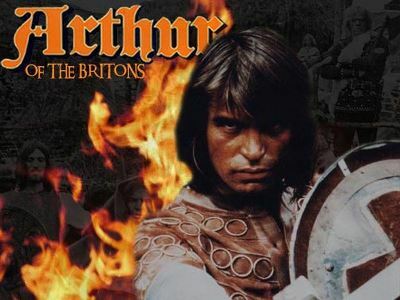 Arthur of the Britons: Original Soundtrack Recording accomplishes everything a soundtrack for a historical drama should. It evokes the time period with familiar leitmotifs and orchestrations evocative of the era. Rather than being unobtrusive background music, the soundtrack in this case becomes a proactive part of the production. Lewis intertwines Bernstein’s theme in various compositions that the producers use to signify dramatic elements pertinent to the story. Not only for fans of the show, but those seriously interested in film scoring would do well to study and appreciate this rare album. Watched a couple of episodes earlier,thanks for the background on the music. As always, very knowledgeable and informative.